The causes of axillary swelling are divided into superficial axillary swelling and deep axillary swelling. Superficial axillary swelling is due to hidradenitis suppurativa, lipoma, sebaceous cyst and acute abscess. 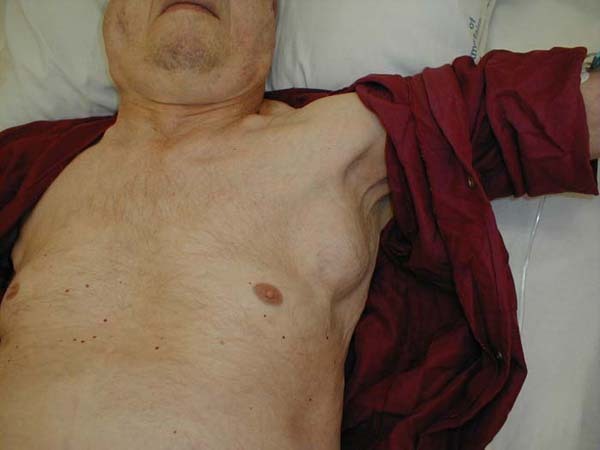 Deep axillary swelling is due to lymphadenopathy, axillary artery aneurysm, chronic abscess due to tuberculosis, lipoma and breast lump in the axillary tail. Most cases of axillary swelling are due to lymph nodes enlargement. Axillary nodes enlargement are mostly due to secondary deposits from breast carcinoma. Axillary swellings are diagnosed mostly on clinical examination alone. Based on the history, lipoma is presented as lobulated soft swelling in the subcutaneous tissue. Sebaceous cyst is presented with firm swelling with punctum on the skin. Sebaceous cyst may be inflamed, tender with discharge from the punctum. Hidradenitis suppurativa is multiple swelling tender in nature that present on the superficial tissue of the axilla. Besides that, a purulent discharge may occur. The patient may present with history of diabetes. Hidradenitis suppurativa is associated with infection of the appearance of the apocrine sweat gland. Acute abscess is also common in diabetic. The patient present with tender swelling and purulent discharge from the skin. Axillary artery aneurysm is a rare condition. It is presented with pulsatile swelling that present under the arm. With each heart beat, the arm will move away from the sides of the body. This occur when the swelling is too large . Distal embolisation may occur and presented with signs and symptoms of the hand. Lipoma is notice by a patient as a swelling firm in nature that intermittently appear and slipping out from the under cover of the muscle. Breast lump may include fibroadenoma and carcinoma that present as a lump in the medial wall of the axilla ( axillary tail swelling). Lymphadenopathy is the commonest cause of axillary swelling. Lump may be tender and sometimes is non tender. Patient is asked regarding any symptoms of pyrexia, cough, night sweat and malaise. Evidence of blood dyscrasia such as epistaxis and bruising should be noted. Look for any evidence of scratch which is suggestive of cat- scratch fever. Check also for sites of malignancy or infection in the rgion of the drainage of the nodes such as the abdominal wall, arm , chest wall, umbilicus, back, iliac crest and breast. Do the patient noticed any lump elsewhere. Chronic abscess is associated with tuberculosis . Observe the patient for any signs of tuberculosis such as fever, night sweat and malaise as well as weight loss. On examination the lipoma may be lobulated soft swelling in the subcutaneous tissue.The sebaceous cyst is a well defined small swelling in the skin with a visible punctum. The lesion may be tender and the surrounding skin will be red. Discharge may occur. On inspection, purulent discharge with red, tender and fluctuant swelling indicated acute abscess. Hidradenitis suppurutiva is diagnosed by the present of multiple swelling, tender in nature, with discharge of pus or surrounding erythema. Axillary artery aneurysm is presented as a palpable pulsatile mass within the axilla. The distal circulation is evaluated. As the lump pulsates, the arm may move away from the sides of the body while the patient is standing. This condition confirm the present of large axillary artery aneurysm. Deep lipoma does not has the lobulated feel and firmer than superficial lipoma. Deep lipoma will be slip in and out of the pectoral muscle. Deep lipoma may only be felt in certain position and usually inter muscular. Lymphadenopathy may present as tender, fluctuant node ( abscess), matting of the nodes/numerous hard nodes ( carcinoma) and single discrete nodes ( lymphoma). Check for any tumor or signs of infection in the region of lymphatic drainage. Perform examination of the breast and check other sites of node ( inguinal node, cervical node ). Check also for hepatosplenomegaly. A lump in the axillary tail or medial wall of the axilla may indicates breast lump. Chronic abscess may present as fluctuant swelling in the axilla. Chronic abscess due to tuberculosis may be little or no signs of inflammation. The investigations require may include full blood count, ESR, swab, ultrasound, chest x ray, Mantoux test, arteriography, mammography and fine needle aspiration and cytology. Full blood count may show decrease in hemoglobin level in malignant disease. Raised white cell count in leukemia or infection. Raised ESR in malignancy and infection and reduction in platelet level in leukemia. Swab is taken for any microscopic analysis or culture and sensitivity test. Ultrasound is useful for detection of aneurysm, lipoma and lymphadenopathy while chest x ray and Mantoux test for tuberculosis. Fine needle aspiration is useful to distinguish between benign and malignant condition. Arteriography is useful to assess axillary artery aneurysm ( distal circulation) and mammography for detection of breast carcinoma.